Trigeminal neuralgia, also known as tic douloureux, is a painful disorder of a nerve in the face called the trigeminal nerve or fifth cranial nerve. 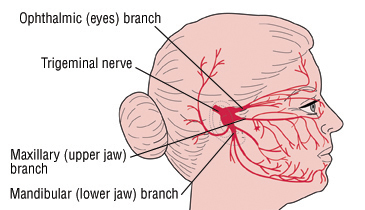 There are two trigeminal nerves, one on each side of the face. These nerves are responsible for detecting touch, pain, temperature and pressure sensations in areas of the face between the jaw and forehead. People who have trigeminal neuralgia usually have episodes of sudden, intense, "stabbing" or "shocklike" facial pain. This pain can occur almost anywhere between the jaw and forehead, including inside the mouth. However, it usually is limited to one side of the face.